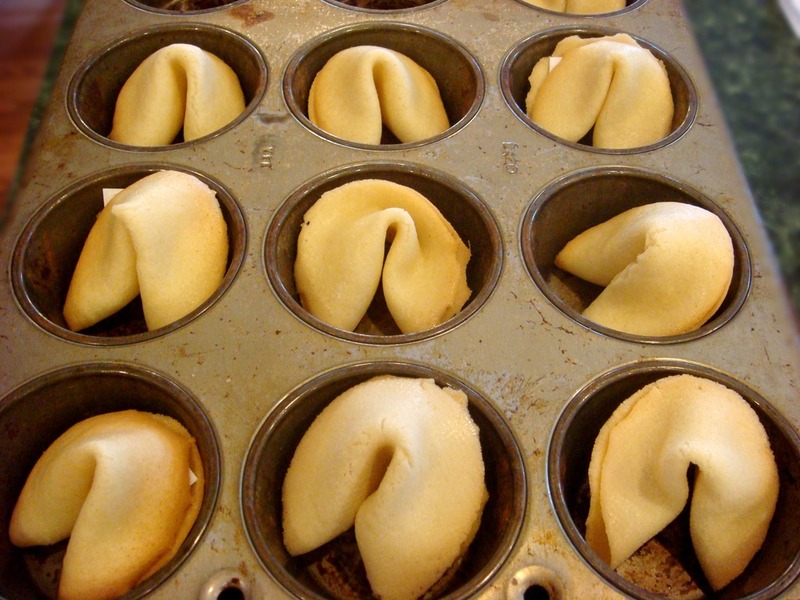 As we approach Chinese New Year which begins on February 10, I want to share a recipe for homemade fortune cookies and also my favorite fortune (from a cookie) ever. A few years ago I was serving in a responsibility at church that most of the time filled me with love and gratitude, but also involved a heavy time commitment and occasionally left me feeling heart-sick about things that I could not fix. After one such day, Brian and I went to dinner with some good friends. 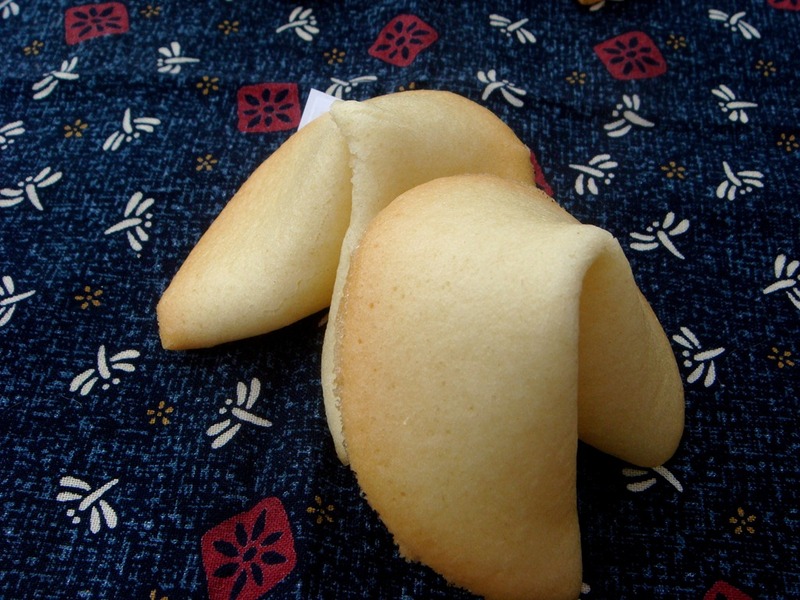 After the meal, the traditional fortune cookies were served. I received the most timely fortune. It is the only one that I have actually held onto and occasionally reread. I know this doesn’t sound like an especially cheery sentiment, but it described exactly how I was feeling at the time. It was also a wonderful nostalgic reminder of the time we spent living in Japan. My Japanese is extremely limited, but one of the concepts that fascinated me there was the concept of uncomplaining endurance or perseverance, regardless of circumstance. From a religious perspective, we might call this “enduring to the end.” The Japanese have not just one word for this, but a vocabulary that covers an entire spectrum of levels of endurance and different situations which might require endurance. The word “ganbatte”, on the low end of the spectrum might be called out to someone who has just one lap to go in a race or is about to take a hard test. It implies both an encouragement to keep going or work hard and also an admonition to do your best. It implies as well an unspoken wish of good luck in your endeavor. At the other end of the spectrum you have “gaman”, which implies a self-sacrificing patience, endurance and perseverance through extremely difficult and often prolonged circumstances. It is a charge to endure with grace and dignity. 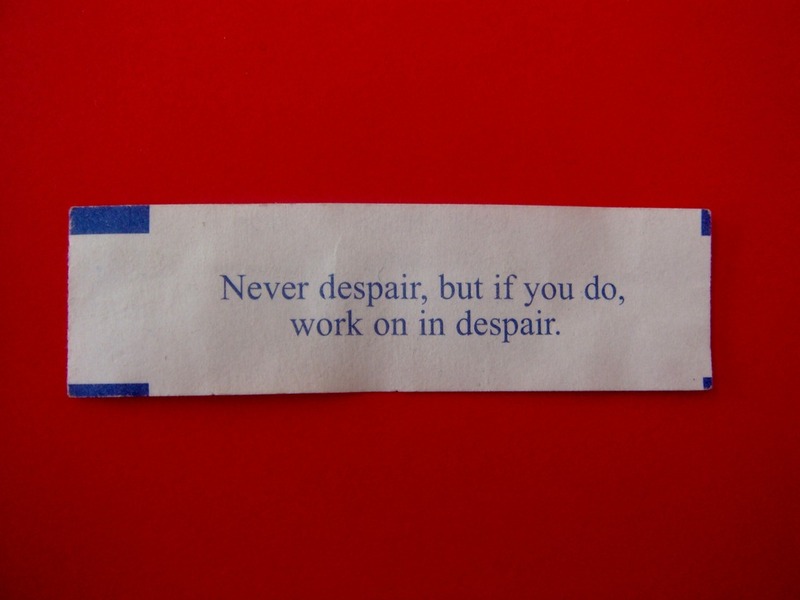 “Work on in despair” is not meant to be a negative concept, but a positive character trait to develop that will bless both you and society at large. 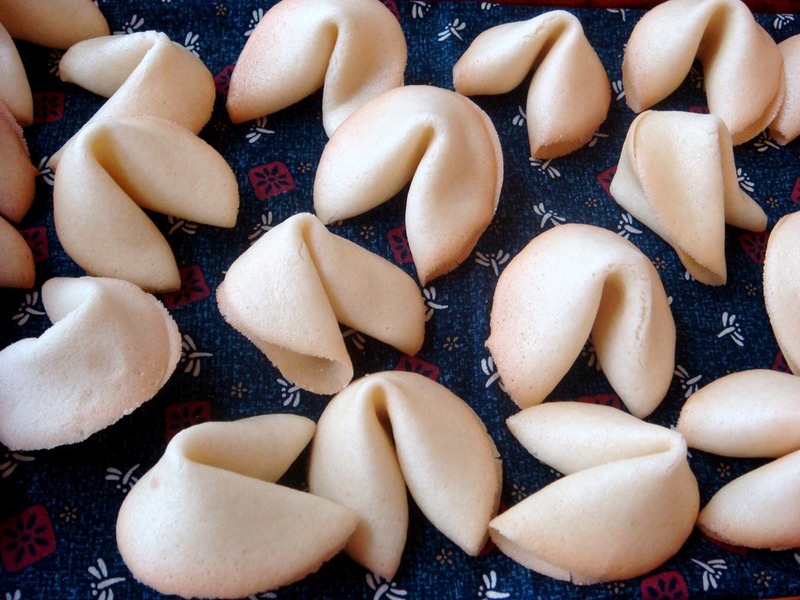 Fortune cookies are made from a thin egg white based batter. You will need to line your baking sheets with a silicone liner or parchment paper. Spread batter in 3-4” circles on your baking sheets. I can get 6 on my baking sheet. The cookies will harden quickly after removing them from the oven. Start with just a couple of cookies on your baking sheet until you get the hang of folding them quickly. The cookies are done when the dough is dry, but not brown. Don’t be discouraged if you ruin a cookie or two trying to get the exact time right (no two ovens are exactly the same). To fold: While the cookies are still hot from the oven, flip a cookie over and place a fortune in the center of the cookie. Gently fold cookie in half (do not flatten center crease; just make the edges meet). 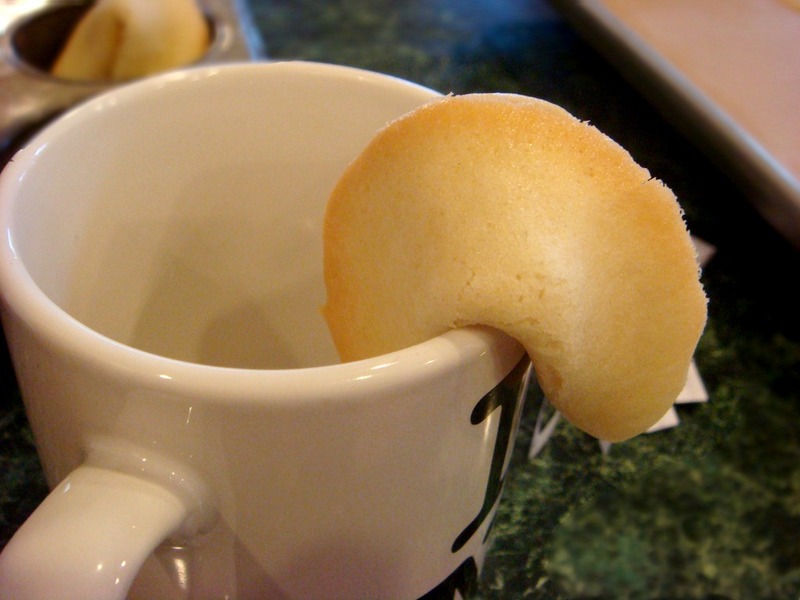 Using a mug or drinking glass, fold the cookie in half again over the edge of the mug. Transfer to a muffin tin to keep cookie from unfolding while it completely cools. Cookies should be eaten the same day, or stored in an airtight container. They will quickly become soft in a humid climate. Making them in the winter here in dry western PA, they will keep for several days without becoming soft. Preheat oven to 300°F. 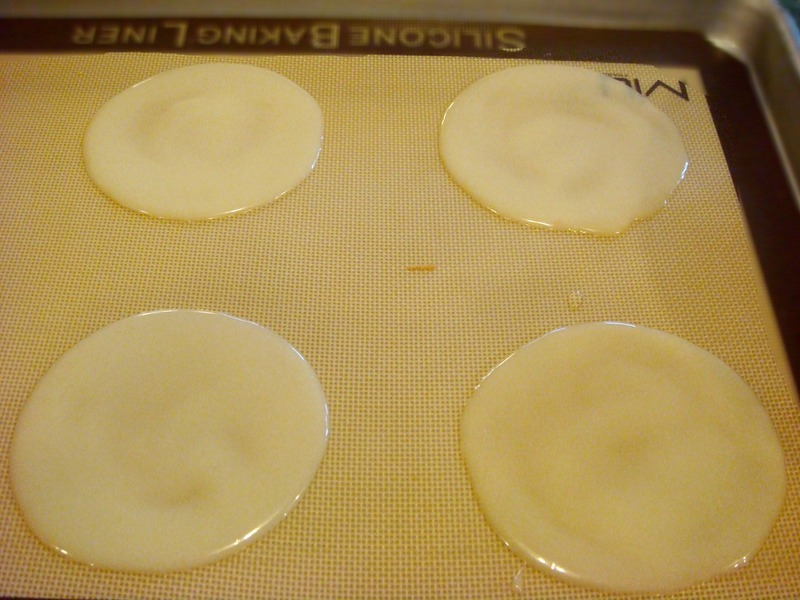 Line baking sheets with silicone mats or parchment paper. Use a whisk to mix flour, cornstarch, salt and sugar in a small bowl. In a separate bowl, use the whisk to lightly beat the egg whites, oil, water, vanilla, and orange or almond extract until frothy. Stir the flour into the egg white mixture and mix until you have a smooth batter. The batter will be thin, with the consistency of a sticky pancake batter and not stiff like a normal cookie dough. Place one tablespoon of batter onto the cookie sheet. Using the back of a spoon, spread batter in a circular motion to make a circle about 3-4 inches in diameter. Place 4-6 cookies on a baking sheet (start with fewer cookies until you get the hang of folding quickly). The batter should be very thin on the baking sheet. If it’s too thick the cookies won’t fold without breaking. Bake for 11-14 minutes, or until the outer edge of each cookie barely begins to brown. TO FOLD: Immediately after removing baking sheet from the oven, working very quickly, remove a cookie with a thin metal spatula and flip it over onto a clean plate or mat. Place a fortune in the middle of the cookie (let one end slightly extend beyond edge of cookie, if desired). Fold the cookie in half, but do not flatten center crease; just make the edges meet gently. Fold cookie in half again by gently pulling the edges downward over the rim of a mug or glass. Place the finished cookie in the cup of a muffin tin so that it keeps its shape while it cools. Continue with the rest of the cookies. Let cookies sit, uncovered, for 1-2 hours (so that they harden completely). Cookies are best eaten the same day, especially if weather is humid. In drier climates, cookies will keep well for several days.